Whitby Abbey, or at least its skeletal remains, sits on a headland overlooking the North Sea and the pretty Yorkshire harbor town of Whitby. For generations its strange haunting beauty, especially at sunset or in a full moon, has sent shivers down the spine of impressionable visitors. That's not surprising, as its gothic weirdness inspired one of the greatest horror stories of all time, "Dracula." The Abbey played an important role in the early history of the English Church as well. 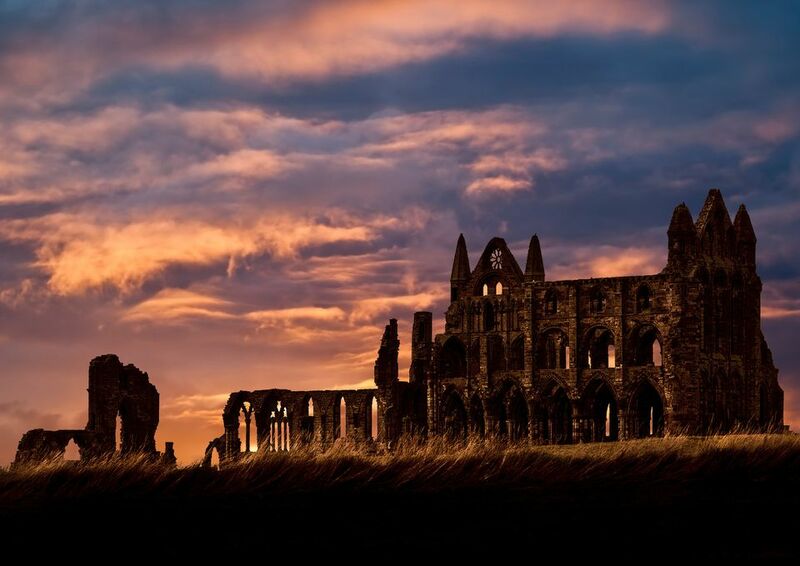 In 657, when the first monastery was established at Whitby, then part of the Anglo Saxon kingdom of Northumbria, there were two forms of Christianity practiced in England. Celtic Christianity, claiming it's lineage from St. John the Evangelist, was spread by Irish monks of Iona and Lindisfarne (where the famous Book of Kells was created). Roman Christianity, had been brought by missionaries, like St. Augustine, from Rome. Each denomination had its own style of monastic dress and monastic rule and each had a different method of determining the date of Easter. Today, it may seem superfluous, but in the 7th century, determining the date of Easter was vitally important. In Northumbria, both Celtic and Roman Christianity were practiced. In fact, while the king and his court celebrated Easter, his queen and her supporters were still fasting for Lent. In 664, to settle the matter, the Anglo Saxon King Oswiu summoned important churchmen on both sides to debate before him at Whitby. After listening to the arguments, he asked the parties to tell him who was the gatekeeper of heaven. Both sides agreed it was St. Peter. At that, the King smiled, according to the chronicles of historian the Venerable Bede, and chose the Roman rule (St. Peter's side), saying "otherwise, when I come to the gates of heaven, there may be no one to open them, because he who holds the keys has turned away." Northumbria, at the time, was the largest of the Anglo Saxon Kingdoms and its adoption of Roman Christianity quickly spread across Britain. Since that time, the 7th century church vanished and the ruins on the hill today are all that remain of an abandoned, 13th century Benedictine monastery allowed to fall into ruin. Writer Bram Stoker, who penned the novel "Dracula," had a day job as business manager for the Victorian "superstar" Henry Irving. In 1890, After a difficult tour of Scotland, Irving suggested Stoker take a break in seaside Whitby. He was there on his own for a week before being joined by his family. During that week, he was moved by the eeriness of the abbey. He also visited the Whitby public library where he read about a 15th century noble, Vlad Tepes. Tepes, who impaled his enemies on wooden stakes, was known as Vlad the Impaler and Vlad Dracula. Stoker noted down the details, along with the date he had found them. While in Whitby, Stoker also learned about the shipwreck of a Russian ship, the Dmitry from Narva, which ran aground with its cargo of silver sand below the cliffs. This information also found its way into his landmark novel. In "Dracula" the vessel had become the Demeter from Varna. And when it ran aground, on August 8, with all aboard dead, a black dog escaped and ran up the town's 199 steps to the church just below the abbey. As English Heritage, who manage the site, point out, August 8 was the date Stoker noted down when he read about Vlad Tepes in the Whitby public library. When: The abbey, grounds and museum are currently closed (as of January 31, 2019) until at least April 1, 2019, while £1.6 million is being spent on renovations and improvements. These will include a new facilities in the visitor center, improved entrances to reduce waiting times and new, interactive displays in the museum and around the grounds. Visit their project website to keep up with the changes afoot. Hours and tickets: Prices and opening times will be announced on the English Heritage Website closer to the reopening date. Prices in effect before the closing were £7.90 for an adult, up to £20.50 for a family of up to two adults and three children. These are unlikely to change dramatically when the Abbey reopens. Directions by car: The town of Whitby is reached on the A171 in North Yorkshire, then follow local signs to the abbey. It is on the clifftop, East of Whitby. Pay parking is 100 meters from the abbey entrance. Disabled visitors can be set down closer to the entrance. There is also disabled parking in the main parking area with ramped access to the entrance. Directions by train: Whitby Station is 1/2 mile from the abbey. Check National Rail Enquiries for train times and fares. There is local bus service from the station to the abbey. If you walk, it involves a famous stone stairway of 199 steps. The steps are wide, there are railings on both sides and the views from the 199 Steps are worth the walk.The abbey is behind St. Mary's Church, which also features in the Bram Stoker novel. Travel tip: This is one journey where driving is a better option. local train services are notoriously sporadic on the east coast and even from York, which is less than 50 miles away, the train journey will take more than three hours. Take a trip on a 1938 vintage lifeboat: The Mary Ann Hepworth leaves from New Quay near the Swing Bridge every half hour between 10a.m. and dusk for a cruise on the Esk River. Have the Captain Cook Experience : Captain Cook apprenticed to a ship captain from Whitby. Travel from Whitby Harbour to Sandsend on a 40 percent-sized replica of the HMS Endeavour, the ship Cook sailed on for his 1768 scientific expedition. Whitby Coastal Cruises offers coastal and river cruises, whale watching trips and cruises to the unbelievably scenic village of Staithes, including an hour ashore. Visit the Captain Cook Memorial Museum: Housed in the building where he lodged when he was an apprentice. Visit The Whitby Museum: Founded in 1823 by a group of Whitby "gentlemen" it houses archaeology, Cook memorabilia, things brought back to Whitby by its ship captains, fossils, social history, ceramics, militaria, toys. This is a quirky local museum that has preserved its Victorian main hall and also has a new addition for modern exhibitions. Eat great, traditional fish & chips and cold water seafood at Quayside, Trenchers, or the Magpie Cafe.